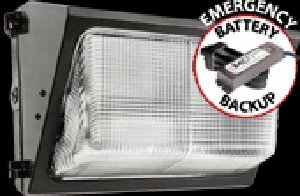 RAB Lighting mid sized wallpack with emergency battery backup and glass lens. All aluminum precision die cast construction with tempered glass refractor. UL listed: Suitable for wet locations. HID fixtures can be wired with 90 degree C supply wiring if supply wires are routed 3" away from ballast. Reflector: Specular anodized aluminum, removable for installation. Symmetrical light pattern maximizes distance between fixtures. Finish: Chip and fade resistant polyester powder coating. Housing: Die cast aluminum, 1/2" NPS tapped holes top, both sides and back for conduit or photocontrol. Hinged refractor frame. Continuous silicone rubber gasket. Refractor: Prismatic optics designed to minimize glare and throw light down and out. Heat resistant borosilicate glass. Cutoff lens: Tempered glass. Emergency battery backup: Bodine "Coldpak" will operate the CFL lamp for 90 minutes if power fails. Rated -20 degree C to 55 degree C. Battery is a maintenance free NiCad with 7 - 10 year life. Wired for 277V. Patents: RAB sensor and fixture designs are protected under U.S. and International Intellectual Property laws. Recovery act (arra) compliant: This product complies with the 52.225-21 "Required Use of American Iron, Steel, and Manufactured Goods - Buy American Act - Construction Materials (October 2010). This product is a COTS item manufactured in the United States, and is compliant with the Buy American Act and Trade Agreements Act. Gsa schedule: Suitable in accordance with FAR Subpart 25.4.